If you design or host websites for people, most of the time they will want to have access to their own server so that they can upload stuff to the server. Normally the FTP client FileZilla software will be recommended because it’s free and also currently in active development. To guide them over the phone in setting up FileZilla can be quite a pain because you need to teach them to download, install, configure the FTP server settings, and then how to upload the files to the path that they want. If the user only requires to upload to one single folder, then FTP Droplet Lite will be very useful. 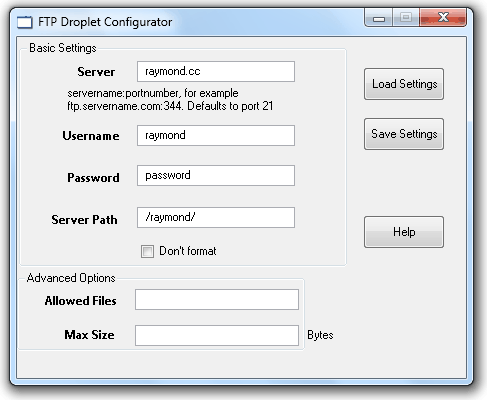 With FTP Droplet Lite, the user that wants to upload files to the server doesn’t need to know the FTP login details, or even selecting the path that they want to upload. All they need to do is select the files that they want to upload from their computer and click a button to upload. Uploading Files through FTP for dummies can’t get any easier than this! FTP Droplet Lite comes with 2 (.exe) executable files and 2 (.dll) dynamic link library files. First you need to setup the configuration file by running the configurator.exe. Enter the FTP server address, username, password and path. By default port 21 will be used but if you need to use other ports, then define it by following the example raymond.cc:888 (888 is the port number). The server path is where the files will be uploaded to. As for the Don’t Format checkbox, you don’t really need to use that because the configurator automatically adds a slash to make sure that the server path is valid. The advanced options such as allowed files and max size is not working in this free Lite version. When you’re done with the configuration, click the Save Settings button and the settings are encrypted and saved into settings.ini file. To upload files, run the FTP Droplet Lite.exe, click the Choose File button to browse the file that you want to upload and click the Send File button to start uploading. Make sure that you don’t include the configurator.exe when you want to send it to your customers because they may mess up the FTP login details that are saved in settings.ini file. During testing, I found that there are some restrictions on this program. You can only upload one file at a time and it automatically replaces files that exists without checking or prompting for further actions. There is no password protection for settings.ini which allows anyone to get the FTP username and password by putting the configurator in the FTP Droplet folder and click the Load Settings button. Other than that, it lacks of SCP or SFTP support because FTP protocol sends the login credentials in clear text which any packet sniffer can pick it up. 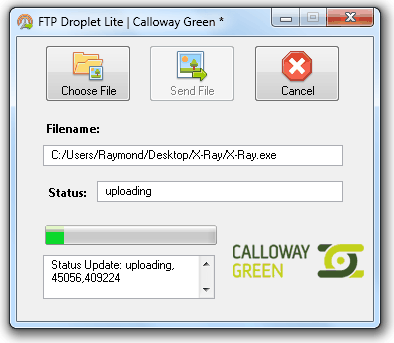 Calloway Green, the developer of FTP Droplet no longer host this software on their server nor you can find any information about FTP Droplet on their official website. Thankfully Softpedia kept a copy of FTP Droplet Lite in their file servers. FTP Droplet is really very useful when you want to allow people to upload files to servers using FTP but without them knowing anything about FTP. Can’t seem to find anything similar but if you know any, please leave a comment. You meant it’s kinda hard coding the user and pass in?